Bob Delbridge, left, shakes hands with SavATree COO Don Becker, right. 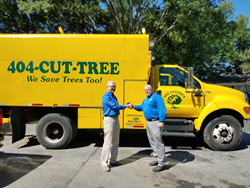 SavATree acquired 404-CUT-TREE in Norcross, Ga. This is SavATree’s first branch in Georgia, opening up a whole new region for the Bedford Hills, N.Y.-based company. Terms were not disclosed. SavATree ranks No. 16 on the forthcoming 2018 LM150 list of largest landscape companies with $109 million in 2017 revenue. The company made several acquisitions last year, including that of Denver-based Swingle Lawn, Tree & Landscape Care, Sterling, Va.-based Thrive Plant Health Care Solutions and Lakewood, Colo.-based Mountain High Tree, Lawn & Landscape. The existing 404-CUT-TREE team will remain intact. The location will also expand its range of service offerings to include lawn care, plant health care and organic treatment options. “SavATree has a strong reputation for professionalism and integrity in the industry, and I feel confident that our clients will receive excellent care in their hands,” said Bob Delbridge, owner of 404-CUT-TREE, which was founded in 1999.